In the August 2013 issue of Harper's magazine, there's a feature story on "the dismal future of the global fishery." In conjunction with the piece, photographer Dominic Bracco II and writer Erik Vance produced a short documentary, "After the Fish Are Gone." The video leads with the harrowing statistic that 85 percent of the world's fisheries have been fished to their limits or totally exploited. A Mexican fisherman, Piolin, describes the drastic changes in the sea he's seen since he began fishing as a teenager. After a long day of work, he sits in his hammock near the shore and talks about what his life on the sea means to him. He paints a picture of his life in the town of Kino -- filled with drug traffickers and poverty. It's a bleak existence, but he finds solace in the sea. One of summer's greatest pleasures for the lucky beachgoer is listening to the rhythmic lapping of ocean waves. A number of factors power this trance-inducing phenomenon, but the most important generator of local wave activity is actually the wind. "The main driver or cause of waves is wind," said Wayne Presnell, a meteorologist with the National Oceanic and Atmospheric Administration's National Weather Service Marine and Coastal Services Branch. Presnell explained that wind speed and duration help in determining the size and frequency of ocean waves. Another factor is called "fetch," referring to the span of water over which a breeze blows, and the longer a fetch, the more energy a wave can build up. "Fetch has some effect on waves at the beach," said Presnell, "but mostly the ones you see playing there are generated by local wind and the wind speed for that day." To get a sense of wind-created waves, simply blow over a bowl of liquid, for instance. A series of waves will follow your exhalation's path even when wind is blowing out to sea, waves still come ashore as a result of the shape of the ocean basins. "That's the general motion of the ocean, if you will — it pushes water toward the shore," said Presnell. Envision the sloshing in a bathtub, Presnell explained: When some force is added to the water, the sloshing heads toward the edge of the tub and then goes into a back-and-forth motion. The wave visible above the level of the water is in fact only part of the wave; the wave extends down through the water column to the ocean floor as well. Waves start out in the deep, open ocean as relatively vertical in shape, Presnell said. As a wave travels toward the shore, though, the bottom part of the wave drags along the ocean floor. The upper part of the wave above the water line starts to move faster than the rest of the wave. As the ocean depth decreases closer to shore, the drag on the wave's bottom becomes stronger, and the upper part of the wave begins to tilt forward. 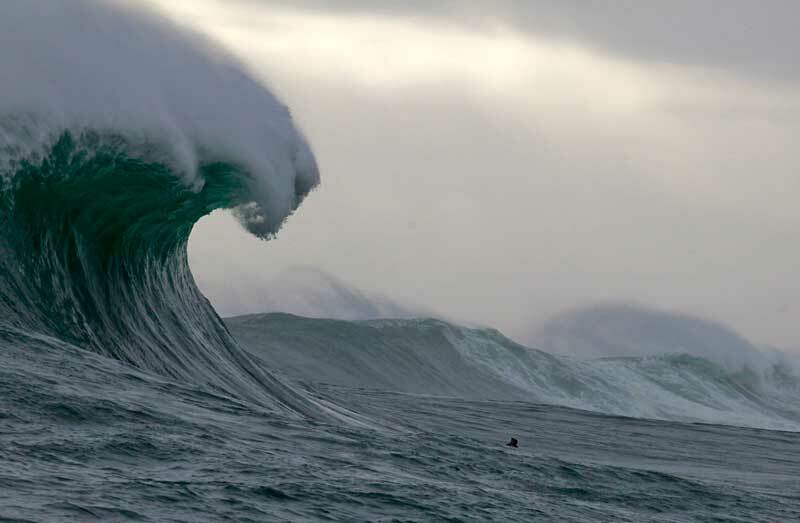 At a certain point, the wave tilts enough that it curls over, creating what is called a breaker and showing off the characteristic, rolling shape of a crashing wave, Presnell explained. 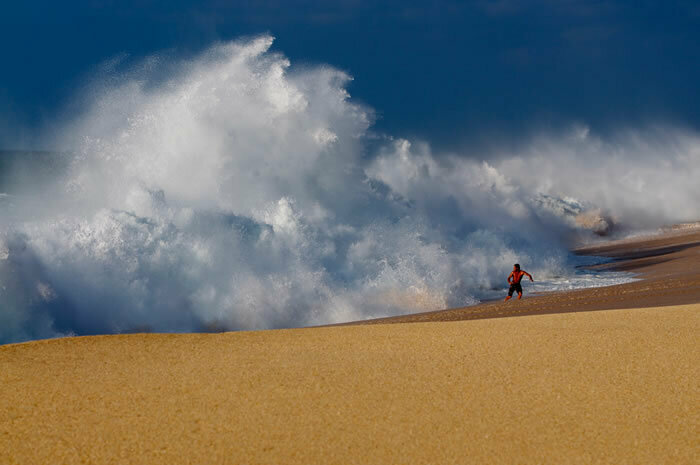 The area between the shore and the first line of breaking waves at the beach is known as the surf zone. "The surf zone is where people do most of their activities, like fishing and swimming — it's where most people go and have fun at the beach," Presnell told LiveScience. All that ocean water being thrown up on the beach by the waves must flow back out. This outflow does not happen uniformly, because the water will return to the sea where it is easiest to do so, such as through a break or dip in sandbars offshore, or near a pier or jetty. In these situations, strong "rip currents" can develop that put swimmers at risk of drowning. "As water comes up on shore it loses momentum and energy and it has to go back toward the ocean," said Presnell. "A rip current is caused when certain things on the ocean floor funnel that water into a narrow stream." Rip currents often appear frothier or darker than surrounding water, which helps swimmers (and lifeguards) spot them. In order to escape a rip current, swimmers should not try to swim straight back to shore, because they will be fighting the current and exhausting themselves. Instead, swimmers should aim to get free of the narrow rip current by moving parallel or diagonally to shore. Alerting a lifeguard, if one is on duty, is also a good idea. "Yell for help, and draw attention to yourself," said Presnell. "Then do your best to get back to shore by swimming parallel or at an angle where you don't feel the resistance." Before frolicking in the waves, consult a lifeguard or other information source at the beach to get information about that day's conditions and if rip currents are expected. "The first thing to do or remember is to check on the condition of the ocean before you go in there," said Presnell. "Know what you're getting into before you get into it." Captain Cook 'discovers' Tahiti and Hawaii. The natives tell Cook how they navigated the vast Pacific Ocean. Later commentators dispute this, and some natives of today---many decades after ravages of their culture by outsiders--decide to rebuild the ancient navigation knowledge and traditional sailing canoes to create a new legacy of wayfinding and revive the spirit of the ancestral way as they teach others to face new horizons. Herb Kawainui Kane speaks about Thor Heyerdahl and his Kon-Tiki expedition, and then the Hokule'a (Hōkūle'a)-- a re-created ancient double-hulled voyaging canoe (vaka taurua) featured in this extract. Two ocean-going canoes have returned to New Zealand after an epic voyage to Easter Island by Polynesian navigators using traditional craft. The revival of ancient skills continues to gather momentum and has great cultural and political significance for the indigenous people of the Pacific. They waded ashore from their canoes through the luminous turquoise water of the lagoon. The captains, festooned with garlands of flowers, led a procession of around 20 men and women, Cook Islanders, Tahitians, New Zealand Maoris and three sailors from Rapanui, better known to most of us as Easter Island. They were ocean-going, double-hulled canoes, big catamarans with two masts and capable of carrying a crew of 14. One, the 20-year-old Te Aurere, has no nails or rivets, it's entirely lashed together, and all the stronger for that, I was told. Re-naming is the first act of possession. What followed for Polynesia has been summed up in the phrase, "fatal impact," deadly-introduced diseases; raids by slave traders; the arrival of missionaries; colonisation; the nuclear testing era; and now globalisation, a mixed blessing for remote islands with little to offer that can't be produced more efficiently elsewhere. One man who arrived in Rarotonga with the canoes had a quiet charisma, an air of authority. He was a handsome, weather-beaten 51-year-old New Zealand Maori, Jacko Thatcher, the master navigator. It was he who had brought the canoes safely to this landfall with no modern navigation aids. It was having to give up rugby after a knee injury that led him into voyaging and this evolved into a deeper quest to find his roots. He told me of the 66 stars whose rising and setting positions a navigator must know. And an affinity with the ocean is crucial. "You must learn", he said, "to be attuned to changes in wind and wave direction, cloud formations and the passage of birds". So the canoe itself, "becomes an instrument for you". These ancient wayfinding skills were nearly lost. At the end of the last century there was only one man left alive with a complete grasp of them. He was Mau Piaulug from Satawal in the Caroline Islands. Mau was already middle-aged when the Polynesian Voyaging Society asked him to teach a new generation of navigators. Mau invited apprentice voyagers to Satawal where he would be their mentor. For men like Jacko Thatcher, and Tua Pitman from Rarotonga, this was a life-changing experience. We realised, Tua told me, that the ancestral knowledge would bring big responsibilities and a leadership role. "By re-living the connectedness of the islands", he said, "we'd be helping keep alive our identity as an oceanic people". One surviving example of that old connectedness came up during the recent voyage from Easter Island. 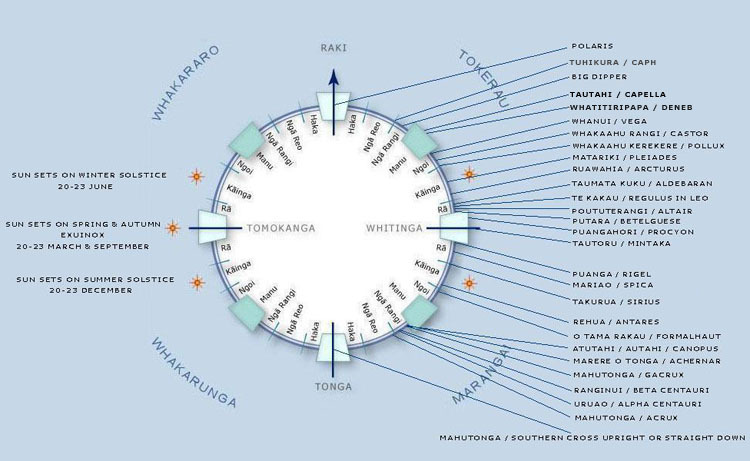 At first the Spanish-speaking Rapanuans, French-speaking Tahitians and the English-speaking Cook Islanders and Maoris on the canoes had difficulty understanding one another. The choice is stay at home or emigrate. And perhaps that helps explain why the master navigators and the double-hulled canoes are held in such awe. They are a powerful reminder of a heroic age not so long ago when those mythic islands of the south seas were more connected and the ocean really was a highway rather than a barrier. "It is not our interest to gain attention on the backs of those who have lost loved ones. This video is supposed to be a showcase for possible UAV applications. Our goal is to display the stranded ship in a never-before seen way. Our thoughts and prayers go out to those who drowned on this day and we are hoping for a swift removal to reveal again the underlying beauty of Giglio Island, Italy." Stunning footage of the ill-fated Costa Concordia captured by a drone has revealed the work underway to salvage hulking wreck. Filmed at sunset, the haunting film shows the stricken ship, where 32 people died, submerged in around 50ft of water. The Costa Concordia has been slowly rusting since it heeled over and partially sank after striking rocks off the small island of Giglio on Italy's west coast in January 2012. Can you spot the Costa Concordia? From far away, the ship looks like an extension of the island. In the YouTube video the unmanned aerial vehicle slowly travels across the ship and weaves in between the appendages, steel cables and anchor chains which have been set up as part of the salvage operation. The aim is to right the 114,000 tonne bulk in the water and tow it away. Last Saturday five people were sentenced for their part in the Costa Concordia cruise ship disaster that killed 32 – but look likely to avoid jail. The four crew members and a company official received jail sentences of between 18 and 34 months after they pleaded guilty to multiple manslaughter, negligence and shipwreck. However, judicial sources said none of the five is likely to be jailed as the sentences of under two years were suspended and the longer ones may be appealed or replaced with community service. The oceans of Earth host creatures as large as Blue whales and microscopic as plankton. Beneath the surface is a landscape of mountains, valleys and plains. The Monterey Bay National Marine Sanctuary between Marin County and northern San Luis Obispo County, for instance, has the Monterey Bay Submarine canyon that plunges a mile beneath the bay floor and the Davidson Seamount, nearly 7,500 feet tall though its peak is 4,000 feet below the ocean's surface. Only about 10 percent of the ocean floor is mapped with the precision that dry land is. Anyone with access to the internet can find maps developed with methods that have evolved in sophistication since the 1800s, from line and sinker to sophisticated sonar. Some work has been done by private institutions and government agencies charged with ocean management. But some was done in secret by the U.S. military including the period known as the "cold war" between the U.S. and the Soviet Union that started after World War II and ended when the former collapsed in 1991. The Navy's involvement started in 1849, producing maps of the North Atlantic by 1853, and international charts that were published in 1905. The military's mapping slowed during World War II but was re-engaged in the late 1940s. Sea floor maps provided strategic information for both the U.S. and Soviet Union in the case of, for example, submarines which were equipped with long-range nuclear missiles. Terri Morgan, an author and journalist who writes occasionally for the Sentinel, credited the work done in secret by her late father Joseph Morgan and others in the Navy as advancing our understanding of the ocean and the sea floor. "Since most of the projects my dad was involved in were during the cold war, a lot of his work was classified," she said. "So it's difficult to find a lot to verify the family stories. But the gist of it all is that the Navy did do a lot of ocean floor mapping during the cold war." After Joseph Morgan participated in the effort to in map the Atlantic he was transferred to the Pacific where his focus was on tracking Soviet submarines. "There was a series of naval stations along the coast, including Centerville Beach, where he was stationed in 1968 and 1969, Point Sur, and Coos Bay, Oregon that were involved in the same project," Terri Morgan remembered. Joseph Morgan retired as a captain in the Navy in 1974. His daughter said he embarked on a second career as a professor at the University of Hawaii and worked on several books. "His works included The Atlas for Marine Policy in the Southeast Asian Sea which includes maps that focus on the seafloor and not the continents," she told me. "He also worked on the Ocean Yearbook. He never lost his fascination with the ocean." "Like most military innovations, war was a good motivator for advancing technology," she said. The internet, which itself has origins in a Department of Defense project, made large amounts of data readily available worldwide. The internet search engine Google launched Google Earth which now includes sea floor images based on work done by people such as Joseph Morgan. 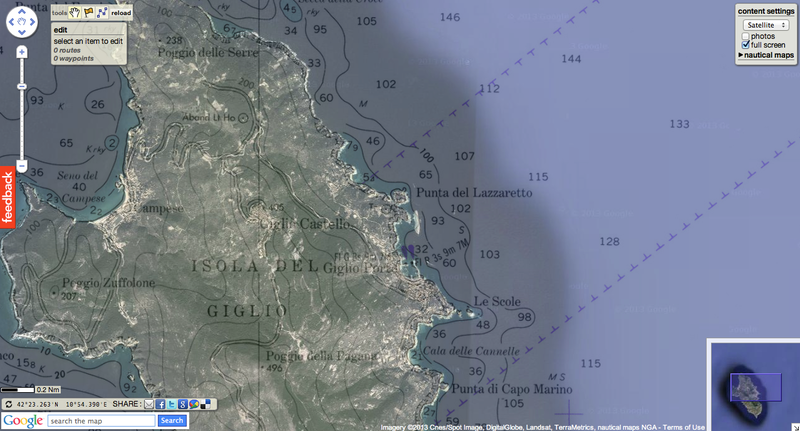 Today 462 AHS raster charts (780 including sub-charts) are included in the Marine GeoGarage viewer. This first film in a series of three (see at the end of this article), introduces the Board of Longitude and the 18th century search for an accurate way of finding longitude at sea. Today Lord Rees will be launching the digitised archive of the Board of Longitude at Cambridge University Library. Stuffed full of the correspondence and work of those who preceded him as Astronomer Royal, it also contains letters and papers of artisans, inventors, expeditionary astronomers and maritime explorers. 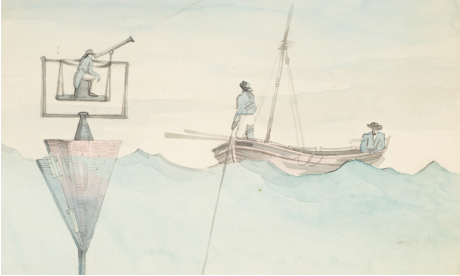 For those not familiar with the story of the 18th-century search for a means to determine longitude at sea, this video, gives an introduction to the project and the story. The digitisation project is a collaboration between CUL and the National Maritime Museum, funded by JISC, and is closely allied to an AHRC-funded project on the history of the Board of Longitude that brings together researchers from the NMM and History and Philosophy of Science department in Cambridge. This association has meant that as well as digitising 48,596 pages from the archives and libraries at Cambridge and NMM, the content is supported by links to relevant object records at the Museum, summaries of all and transcriptions of some of the files and essays on key figures, places, institutions, objects and events. Written by the project researchers, there is enough text there for a couple of PhDs (at least) and a really useful resource for users of the site. I was the laggard who has only contributed one essay so far, on Astronomer Royal Nevil Maskelyne. He was, though, an extremely significant figure both for the longitude story and in this project, which also includes selections from Maskelyne's archive from the Royal Observatory and his personal papers held now at the NMM. While historical researchers will undoubtedly find many ways to start digging into the archive, for those newer to the game there are, on top of the summaries and essays, resources for schools and some selected stories lifted from the archive. The content can take the reader to the observatory at Greenwich, meetings at the Admiralty, artisan workshops of London and the South Seas. 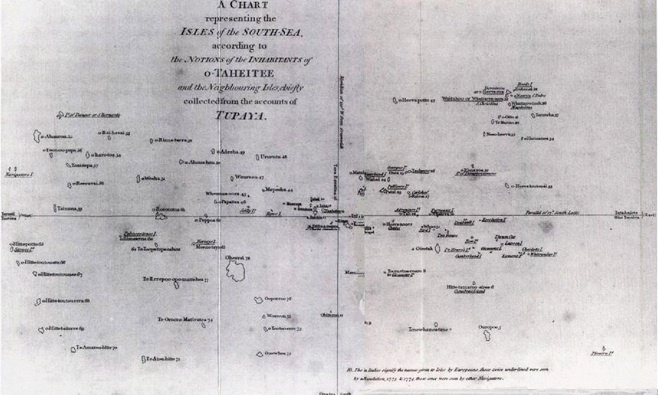 William Wales' map of Easter Island, from Cook's Second Voyage. Key Stage 2 pupils will, we hope, learn about Captain Cook's voyages and Key Stage 3 will be able to think about inventors and enterprise. For those who feel they are familiar with the story of longitude, having read about John Harrison and his sea clocks in Dava Sobel's Longitude, they will find there is much more to explore. The archive places the familiar story of Harrison in its richer context. He was a crucial figure but the story is much broader. It takes in the development of astronomy, exploration and technological innovation and creativity during the period of the Industrial Revolution, the work of the first government body devoted to scientific matters, and public reactions to a challenge many considered hopeless. The longitude story is a spectacular example of expert disagreement and public participation. As well as attracting the greatest scientific minds of the day, the board enticed people who belong to one of the most important traditions in British society; the extreme eccentric. Thus while there may be interest in reading the full story of the Board's dealings with Harrison, eyes are likely to be caught by what were damned by the archive's 19th-century compilers as "Impractical schemes". Some of these are real green ink stuff, with perpetual motion and squaring the circle bound into the seemingly intractable problem of finding longitude. Proposal for finding longitude by determining the ship's rate of sailing. However, there are many other schemes that, while they did not come to fruition, were based on sound ideas. These included improvements to dead reckoning - the educated estimate of position that was not displaced by chronometers until the 20th century - or ways to steady an observer sufficiently to allow them to use Jupiter's satellites as a celestial timekeeper (the standard means of determining longitude on land). In its later life, the Board supported the two successful methods of finding longitude at sea - chronometer and lunar distance - and broadened its remit into other fields. Thus those who explore the digital archive will also land on geomagnetic research, pendulum experiments measuring gravity, the search for the North-West Passage and a young Michael Faraday pulled in to investigate ways to improve optical glass. And much more besides - go on, dive in! This is the final film in the series and tells the story of how the Nautical Almanac was produced thanks to work of a band of human computers. This publication helped sailors find their position at sea. One breath at a time, husband and wife freedivers Christina and Eusebio Saenz de Santamaria explore the depths of the ocean. Without traditional scuba gear, the divers rely on holding their breath for several minutes at a time, pushing the limits of the human body. Christina and Eusebio’s passion for the water began as children. For Christina, it was inspired growing up on the shores of Sydney with beach excursions spent swimming in the ocean. “When taking underwater photos while freediving and when 'fun' freediving we are only underwater for up to 4 minutes for each dive. However while freedive training our dives can be up to 6 minutes for myself and up to 8 minutes for my husband,” writes Christina in an email to NBC News. Eusebio is able to explore the ocean at depths of 100 meters (328 feet) and Christina up to 80 meters (260 feet). The couple just arrived in Honduras, and over their next two months in the Caribbean they plan to break their current depth records.